The CLP-675 Yamaha Clavinova is an exceptional digital piano boasting a GrandTouch Keyboard action that emulates a Yamaha’s premier grand pianos. The realism and resistance of touch coupled with sound samplings from Yamaha’s CFX concert grand and esteemed Bösendorfer pianos. Select your cabinet color option below and click “add to cart” to buy today! You’ll hear and feel the difference from the very first notes. Outstanding sound from some of the finest grand pianos ever made, together with authentic touch and sensitive response, ensure that a Clavinova delivers expressive capabilities and a dynamic range that redefines the standard for digital pianos today. The sound of the Finest Concert Grand Pianos – The CLP-675 reproduces Yamaha’s legendary 9’ CFX concert grand and the legendary Bösendorfer Imperial in meticulous detail. GrandTouch Keyboard – Clavinova’s GrandTouch Keyboard simulates the realism and resistance of a grand piano. While grand pianos have a light touch when played gently and a heavier touch when played with more strength, most digital pianos have uniform resistance regardless of how the keys are played. Clavinova’s GrandTouch Keyboard simulates true key resistance, offering a more responsive touch and a greater dynamic range than ever before. Virtual Resonance Modeling (VRM) – In a grand piano, the sound resonates through the soundboard and cabinet providing rich reverberations that envelops the room in sound. 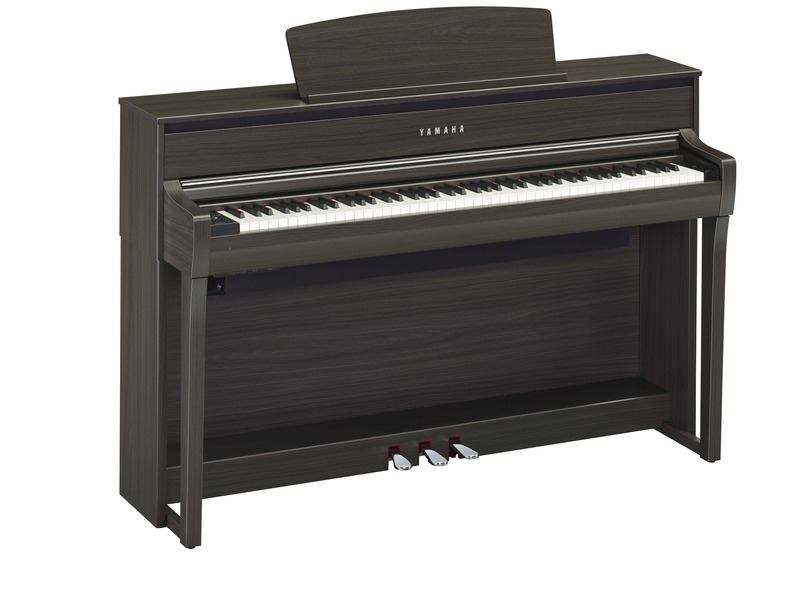 The Yamaha CLP-675, like the rest of the CLP Clavinova Pianos, the CLP-675 has Virtual Resonance Modeling that calculates the various states of the strings from each of the 88 notes on the keyboard from one instant to the next, and timing and depth of damper pedals pressed. The enhanced VRM now also calculates aliquot resonance in the upper octaves, and the full resonance of the soundboard, rim, and frame. This technology allows the digital piano to provide a vivid, bright, and rich voice. Experience the realism of the Clavinova CLP-675 at any of our three Utah Piano Gallery locations for more information about the features, extras, music, and apps associated with our digital piano selection.